The lack of blood flow and oxygen delivery to myocardial tissue results in a progression of events. These events begin with subendocardial ischemia and, if oxygen delivery to the tissue does not improve, transmural ischemia will ensue. This is followed by diastolic dysfunction, systolic dysfunction, electrocardiographic changes, and finally angina. The early occurrence of abnormal perfusion in this cascade of events emphasizes the importance of perfusion imaging. Multiple modalities have been employed to evaluate myocardial perfusion. These include fluoroscopic angiography, single photon emission computed tomography (SPECT), positron emission tomography (PET), contrast echocardiography, and cardiac magnetic resonance imaging (CMR). 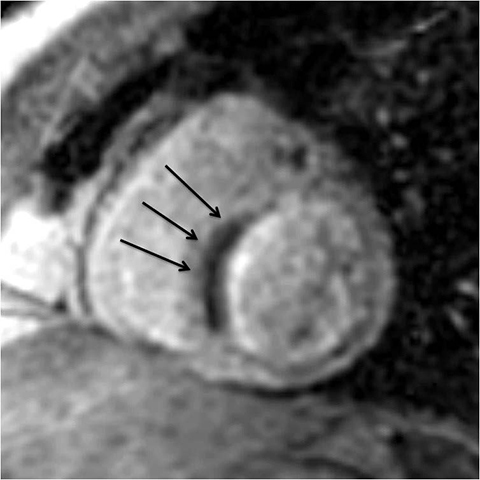 This article focuses on the myocardial perfusion techniques of CMR including contrast agents, pharmacologic stressors, sequences, imaging planes, image post processing, and future applications. With the exception of contrast echocardiography, CMR is the only listed modality that does not require ionizing radiation, making it a useful tool for serial exams. 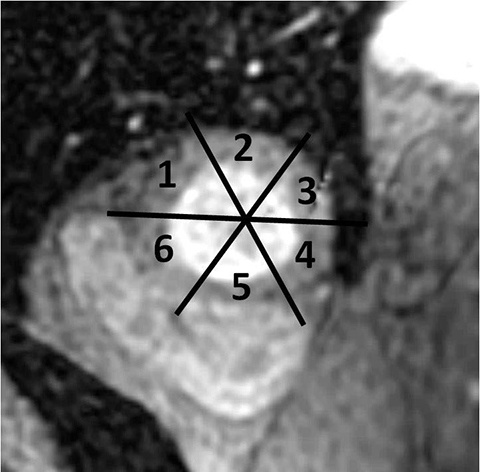 CMR offers high spatial resolution which is ideal for evaluating the subendocardial layer. Rapid tracking of contrast agents utilizing CMR's high temporal resolution provides detection of myocardial blood flow both under pharmacologic stress and rest. The perfusion characteristics can be combined with anatomic structure, function, and tissue characterization in the same exam. Additional imaging including blood flow characteristics of both right and left sided valves can also be completed. A myocardial perfusion study including cardiac structure, biventricular function, valvular assessment, stress and rest myocardial perfusion, and infarct imaging can be completed in 30 minutes. This makes stress CMR a well fitting modality in today's complex multimodality imaging world. Cardiac MR techniques are being explored for the possible perfusion assessment without IV contrast agents. However, until methods of blood oxygen level dependent (BOLD) imaging or arterial spin labeling (ASL) of the heart are perfected, IV contrast agents are required for perfusion assessment. MRI contrast agents function by affecting the relaxation rates of surrounding water protons. This quality is related to unpaired electrons as found in paramagnetic substances. While there are other paramagnetic metal ions, gadolinium is accepted as the standard MRI contrast agent. The majority of the different brands of gadolinium contrast agents all have similar properties when it comes to myocardial perfusion, differing predominantly in their chelation preparation around the gadolinium.1 Gadolinium chelates are water-soluble and are able to diffuse rapidly into the extracellular space across the capillary membrane. They are not, however, able to enter through intact cardiac cell membranes. Coronary perfusion is the primary factor affecting the concentration of the gadolinium compound in the myocardial tissue. Myocardial ischemia is detected by reduced or delayed early-enhanced signal intensity. The heterogeneity of the ischemic tissue does not last long as recirculation leads to equilibration between the vascular and extracellular compartments, usually within seconds. This emphasizes the importance of first-pass imaging of the contrast agent. The gadolinium contrast agent is delivered as a bolus intravenous injection. Intact right ventricular and left ventricular function is necessary to keep delivery of the agent to the coronary arteries in its concentrated state. Patients with impaired cardiac function, such as right or left ventricular dysfunction or valvular incompetence, can compromise the contrast delivery and should be recognized by the clinician prior to contrast injection. Gadolinium-based chelates are among the safest injectable contrast agents in current medical use and have a reputation for being safer than their X-ray contrast counterparts.1 Mild adverse reactions such as nausea and hives are among the most common adverse reactions and are self-limited. Despite its safety record, there are reports of serious adverse reactions, including life-threatening anaphylactic reactions with a rate between 1 in 200,000 and 1 in 400,000.2 Nephrogenic systemic fibrosis (NSF) is a very rare irreversible disease linked with gadolinium administration in the setting of advanced renal function impairment. Strict screening protocols of renal function prior to gadolinium administration have been put in place in to eliminate occurrence of this disease. Perfusion defects are more readily detected during stress conditions. First-pass imaging is commonly performed during chemical stimulation, which is used to increase blood flow to the myocardium. Physical stress is not a practical method of cardiac stress for CMR imaging due to limited space within the magnet bore and risk of creating motion artifacts. Stenotic coronary vessels are unable to respond to the vasodilatory stimulation to the same degree as normal vessels, exaggerating regional differences in myocardial blood flow. The differences in regional signal intensity can be caused by loss of distal myocardial perfusion and redirection of flow to the epicardial layer. Generalized vasodilation may also impair high resistance collateral flow. Historically, adenosine and dipyridamole have been the most commonly used pharmacologic stressors for vasodilatation. A newer agent approved by the FDA in 2008, Lexiscan® (regadenoson), has gained popularity. Adenosine acts on the vascular smooth muscle surface to cause vasodilation. Dipyridamole inhibits the cellular uptake and metabolism of adenosine thereby causing an increase in the interstitial adenosine concentration. Lexiscan® is an adenosine receptor agonist. These agents give rise to a super-physiologic increase in vascular flow as opposed to the approximate two-fold increase of vascular flow seen with dobutamine or exercise. Contraindications to administering adenosine and adenosine agonists include asthma, high-grade AV block, sinus arrhythmia, stenotic valvular disease, and carotid artery stenosis. Several substances are competitive inhibitors of adenosine including aminophylline, theophylline, and other xanthine containing foods, such as coffee, tea, cocoa products, and soft drinks. These should be restricted for approximately 24 hours prior to the study. Due to the medications' actions, patients can be become symptomatic reporting nausea, dizziness, flushing, and chest discomfort. Indications for stopping the infusion and terminating the scan include bronchospasm, ventricular arrhythmia, new onset AV block, and bradycardia. An antidote to both adenosine and dipyridamole of IV aminophylline should be on hand for immediate administration. Adenosine has an extremely short half-life of 10-30 seconds. This characteristic makes it a more favorable agent in the setting of adverse reactions. Since becoming generic, adenosine has become less expensive. The protocol calls for giving adenosine over a 4-minute infusion. Dipyridamole has a half-life of 30 minutes. Adverse reactions have the potential to continue even after the administration of aminophylline. Lexiscan® has an intermediate biologic half-life and is injected over a 10-second duration. Dobutamine has a half-life of approximately 2 minutes. Side effects usually subside rapidly. Beta blockers and theophylline should be on hand to potentially treat a prolonged adverse event. Patients undergo first-pass contrast-enhanced CMR perfusion using a body coil or specialized cardiac coil. Scout imaging and cine short axis/long axis slices are performed initially to determine the cardiac position and geometry. The scouts are then used to plan the subsequent scans. Imaging is performed at stress and rest during intravenous injection of the gadolinium-based contrast agent via a power injector at a rate of 5 mL per second. A single-shot gradient echo sequence with saturation-recovery magnetization preparation for T1 weighting and linear k-spacing is used for the first pass. Simulated stress imaging is performed with the infusion of a stress agent, as described previously. The scan is repeated at rest after adequate time for the effects of the stress agent to subside. (Movie 1, Figure 1). Perfusion is determined in at least 3 short-axis slices of the left ventricle located at the base, middle, and apex. Additional long axis slices can be obtained if heart rate allows. The patient is asked to perform shallow breathing during the exam to minimize respiratory motion. Delayed enhancement imaging is completed 10-15 minutes after the injection of gadolinium. The infarct information gained from this sequence has an additive diagnostic effect when used with both stress and rest perfusion imaging (Figure 2). Contrast-enhanced magnetic resonance imaging can be used to evaluate myocardial perfusion patterns. Ideally, first-pass imaging with gadolinium-based contrast agents should result in images with signal intensity directly proportional to gadolinium concentration, allowing for accurate perfusion measurements. 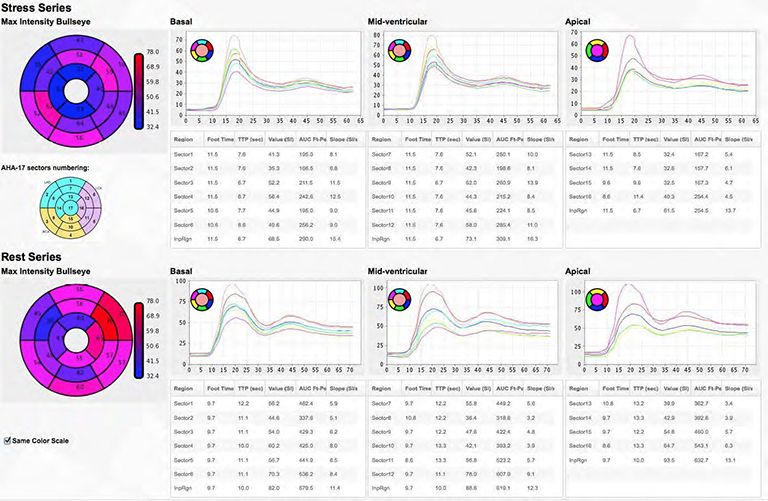 Perfusion can be qualitatively assessed or quantified using computer analysis of changes in signal intensity (SI) over time. Both relative and absolute flood blows can be quantified by the first-pass method. Quantification requires a rapid bolus of contrast by a power injector, producing a single sharp spike determined at time zero. The heart is divided into 3 major segments - base, middle, and apex. The base and middle are divided into six sectors while the apex is divided into four (Figure 3). The apical cap is sometimes included if long axis perfusion is performed. Coronary distribution is assigned to their respective sectors using the 17-segment model for tomographic imaging of the heart (Figure 4).4,5 A comparison of the SI curve for each sector should be made with the left ventricular blood pool. This semi-quantitative image can be placed in a polar plot for quick review (Figure 5). The initial amplitude of the SI curve corresponds with the absolute myocardial blood flow. The myocardial perfusion reserve can be calculated as the ratio of myocardial blood flow at stress over the myocardial blood flow at rest. CMR has the potential of being a one-stop shop when it comes to imaging evaluation of the heart. In contrast to other perfusion imaging modalities, CMR can offer noninvasive examination of the anatomy, function, and perfusion of the heart, all without the use of ionizing radiation. Contraindications for CMR include similar factors as those for other MR imaging. Newer MR safe cardiac pacers make it possible for pacer-dependent patients to receive a magnetic resonance imaging exam. 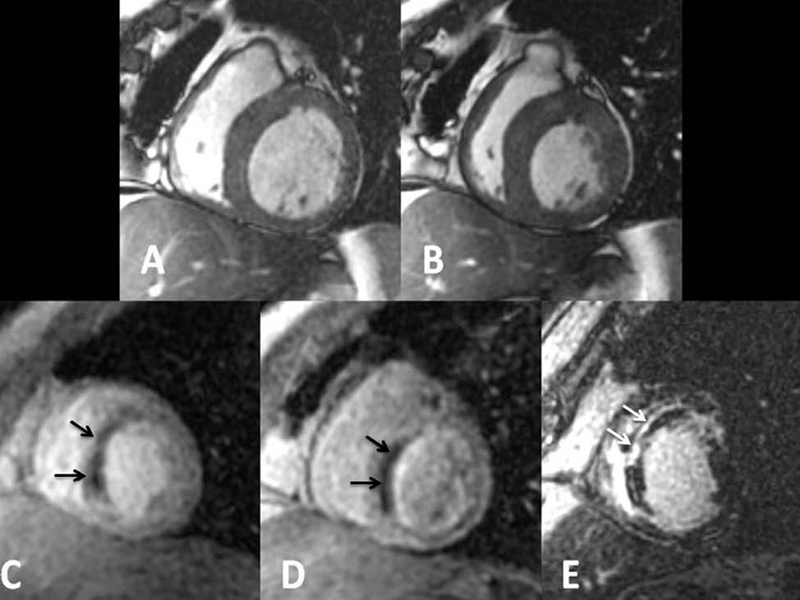 Studies continue to show the utility of CMR as a valuable imaging tool in the assessment of myocardial ischemia. Although more work needs to be done, CMR has a promising future in the comprehensive examination of myocardial perfusion. Higgins CB, Roos AD. Cardiovascular CMR & MRA. Sensky PR, Cherryman GR. Philadelphia: Lippincott Williams & Wilkins, 2003. Edelman RR, Hesselink JR, Zlatkin MB, Crues JV. Clinical Magnetic Resonance Imaging. Larson AC, Li D, Simonetti OP, Oesingmann N. Philadelphia: Elsevier, 2006. Carr JJ: Magnetic resonance contrast agest for neuroimaging: Safety issues. Neuroimaging Clin N Am 4:43-54, 1994. Coelho-Filho et al. : Stress myocardial perfusion imaging by cardiac magnetic resonance provides strong prognostic value to cardiac events in patients with diabetes. Journal of Cardiovascular Magnetic Resonance 2011 13(Suppl 1):O87. Coelho-Filho et al. : Combined stress myocardial perfusion and late gadolinium enhancement imaging by cardiac magnetic resonance provides robust prognostic information to cardiac events. Journal of Cardiovascular Magnetic Resonance 2011 13(Suppl 1):O2. Manning WJ, Atkinson DJ, Grossman W, et al. First-pass nuclear magnetic resonance imaging studies using gadolinium-DTPA in patients with coronary artery disease. J Am Coll Cardiol 1991;18:959-965. Lauerma K, Virtanen KS, Sipila LM et al. Multislice CMR in assessment of myocardial perfusion in patients with single-vessel proximal left anterior descending coronary artery disease before and after revascularization. Circulation 1997;96:2859-2867. Nandalur KR, Dwamena BA, Choudhri AF, Nandalur MR, Carlos RC: Diagnostic performance of stress cardiac magnetic resonance imaging in the detection of coronary artery disease: a meta-analysis. J Am Coll Cardiol 2007, 50:1343-1353. Gebker et al. : The role of dobutamine stress cardiovascular magnetic resonance in the clinical management of patients with suspected and known coronary artery disease. Journal of Cardiovascular Magnetic Resonance 2011 13:46. Schwitter J et al. : MR-IMPACT: Comparison of perfusion-cardiac magnetic resonance with single-photon emission computed tomography for the detection of coronary artery disease ina a multicenter, multivendor, randomized trial. Eur Heart J. 2008 Feb;29(4):480-9. Epub 2008 Jan 21. Costa M et al. : Quantitative Magnetic Resonance Perfusion Imaging Detects Anatomic and Physiologic Coronary Artery Disease as Measured by Coronary Angiography and Fractional Flow Reserve. J Am Coll Cardiol 2007, 50:514-522. Cerqueria MD, Weissman NJ, Dilsizian V, et al. Standardized myocardial segmentation and nomenclature for tomographic imaging of the heart: a statement for healthcare professionals from the Cardiac Imaging Committee of the Council on Clinical Cardiology of the American Heart Association. Circulation 2002;105:539-542. Jenson S, Craig S, York G, Steel K. Review of Cardiac MR Perfusion Imaging. J Am Osteopath Coll Radiol. 2013;2(2):2-7. Dr. Jenson, Dr. Craig, and Dr. York all work with the Department of Radiology, San Antonio Military Medical Center, San Antonio, TX; and Dr. Steel works with the Cardiology Service, San Antonio Military Medical Center, San Antonio, TX.